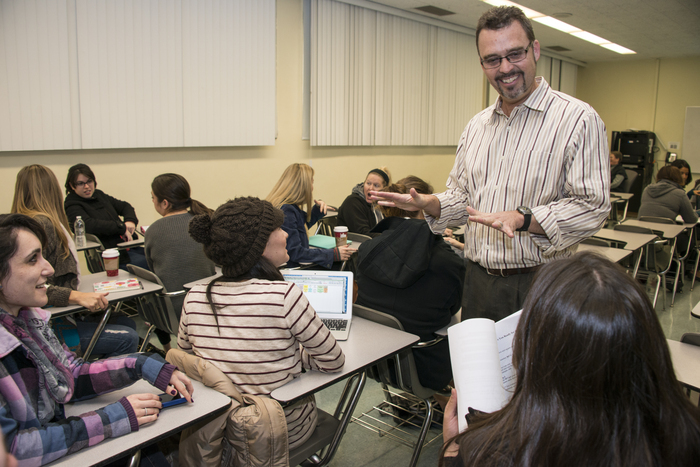 Professor Greg Knotts works with a group of his pre-service elementary teachers in the fall semester. Photo by Lee Choo. His study addresses the ways teachers’ beliefs and experiences influence how they incorporate curriculum on topics related to diversity. Knotts’ work aims to break the mold and push the elementary curriculum towards a well-rounded course of study. “My professional belief [is] that including LGBT history and culture in the social studies curriculum is now a matter of law in California — the first law of its kind,” said Knotts. “The FAIR (Fair, Accurate, Inclusive and Respectful) Act asks social studies teachers to add contributions of LGBT Americans to the curriculum so that we have to be discussing LGBT history and culture. His latest findings were published in the fall 2012 issue of the National Teacher Education Journal as an ongoing effort to incorporate LGBT curriculum into the public education system. Knotts is continuing his research on methods of opening the curriculum platform to multicultural issues. He is currently building his latest study from the results of his last publication by encouraging pre-service teachers to define multicultural education in order to explore new ways of incorporating major demographic issues in social studies curriculum. Knotts’ study focused on a project begun by the Gay Men’s Chorus of Los Angeles called A-Live Music Project (AMP), which attempts to address the disproportionate frequency of hate crimes (14 percent according to a 2009 FBI report cited by Knotts) enacted based on the victim’s sexuality. While there is legislation in place to prevent such harassment, including the Safe Place to Learn Act, Knotts claims that without a comprehensive education to dispel myths about LGBT culture and people, little enforcement against bullying can be implemented. “Without gaining new information, a person is left with hazy conceptions, media representations and a general lack of personal discernment in being able to determine what they understand to be true,” said Knotts. Knotts’ used two of his pre-service teacher classes in the elementary education department as focus groups. He brought in members of the Gay Men’s Chorus to present portions of their current program — usually given to students in grades seven to eleven — which highlighted the role gay jazz musician Billy Strayhorn played in American art and music history. In addition to being an associate professor of elementary education, Knotts is the coordinator of CSUN’s Queer Studies Program, which “provides an academic home for those who wish to study the intellectual, cultural and material conditions that have shaped our current understandings of sexuality and gender variation.” His academic research interests include social construction, creating safe spaces to learn and conscious integration of gender and sexual orientation into social studies curriculum.